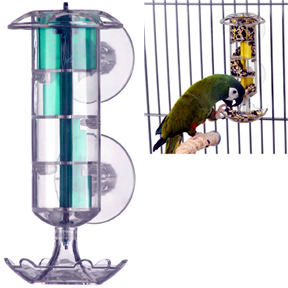 A great, refillable, polycarbonate plastic foraging toy for your smaller to mid sized feathered companions! Unscrew the wing nut and fill top chamber with food. Wing nut must be completely tightened - spins the bottom paddles. Parrot must continue turning the top wheel which rotates the baffles to release small portions of food into the recovery tray on the bottom. Unit attaches to the cage with a double post screw-on fitting. Also, check out the Capsule, Sphere, Wheel, Generation II Wheels, Carousel, Push & Pull, and See Saw foragers! The Paddle Wheel arrives empty and ready for you to fill with your parrots favorite goodies. Offer only dry, healthy treat foods in these feeders, empty them often to avoid spoilage! You can wash all acrylics in one part bleach, 3-4 parts water, rinse thoroughly and air dry!